It might seem counterintuitive, but standing behind the shopper with the full cart at the shorter line will probably get you out of the grocery store faster than lining up behind a line with more people but fewer items. Here's why. Photo by frankieleon. "Every person requires a fixed amount of time to say hello, pay, say goodbye and clear out of the lane," he said in an email. His research found all of that takes an average of 41 seconds per person and items to be rung up take about three seconds each. In short, the time it takes for a cashier to greet and process transactions adds up, and if you get behind too many people with small orders, it can wind up adding up to more time than the person with one order and more items. There's a vanishing point here of course - standing behind one person with a huge cart full will take longer to physically handle every item than maybe one or two people with two items each, so use your judgement. The full Times piece has more suggestions for finding the fastest line at the link below, including looking for lines that lead to multiple checkouts, which essentially cuts the waiting time for a line the same length (presumably) as the other lines; studying what the other customers in line have in their baskets; and, of course, keeping your head in the game and not changing lines every time another one looks shorter. Hit the link below for more. And if the person with 100 items takes a several minutes to count out the $86.65 in notes and coins where is your benefit then? Doesn't always work that way. I've been going to the same supermarket for years, I've learnt how slow certain cashiers are, people with kids and babies will be generally slower, older people and 'soccer mums' will be slower as well. I usually look at a range of factors when deciding which lane to use. But all that gets thrown out the window when the manager taps me on the shoulder and serves me at an empty register. From what you can gather at the time of checking out; It's always about the cashier. You can't tell if a person is going to count out there money one by one. But you can observe the cashier! Are they chatty, social? (there's a big difference, they all should say hi, how are you, etc) but then nothing it should be wam, bam done. that'll be x amount ,etc. This is the line you want. Another thing that can screw you is a price check (customer is questioning the price or PLU isn't on file) you can never see this coming. Apu: Mrs. Simpson, the express line is the fastest line not always. C'mon, this is the best part of going to the supermarket, you can gamble for free, even if you lose you won't lose money. It is rather annoying that people write articles like this for others who are unwilling to observe and think. 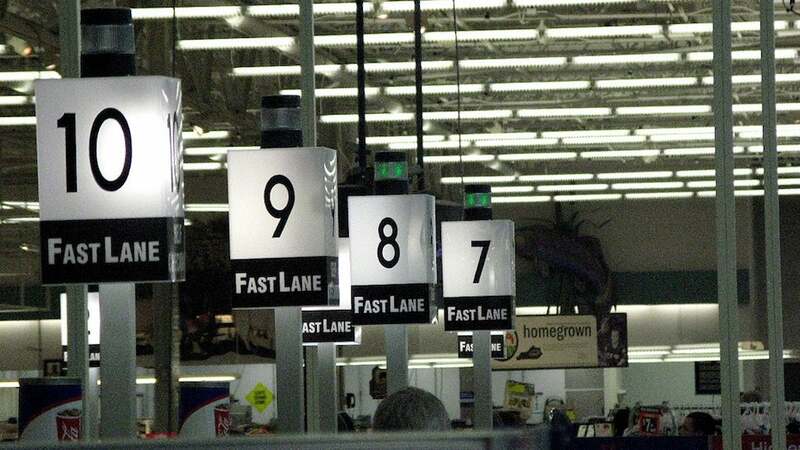 Please write another article encouraging people to line up in the express lane. This is the stupidest. I work in retail and there's no sure thing to getting out quicker. You judge it on the moment, take a punt.